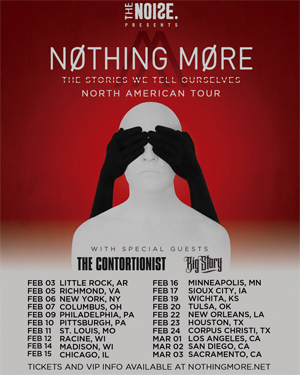 "We're very happy to announce that we will be sharing the stage with NOTHING MORE," says vocalist Michael Lessard. "We have continually tried to tour with bands that excite us and push us to evolve, and NOTHING MORE does both of those things. We look forward to seeing everyone soon!" After wrapping up a successful run with BETWEEN THE BURIED AND ME on their nearly sold out “Colors” tour, the band is headed out once again in continued support of their latest full length, Clairvoyant released in September via Entertainment One/Good Fight Music. The new LP was the follow up to Language, the genre-defying LP that continues to garner critical acclaim. Clairvoyant, which reunited the band with producer Jamie King (BETWEEN THE BURIED AND ME, THROUGH THE EYES OF THE DEAD), took the best elements of THE CONTORTIONIST’s past and reshapes them as the band follows their individual creative muses toward the future. THE CONTORTIONIST saw critics calling the record "gripping adventure," as Metal Hammer did. Alternative Press said Clairvoyant was "best described as magical" and "a record you can truly get lost in." MetalSucks even declared it a "Perfect Album." 2.24 - Corpus Christi, TX @ Brewster St.